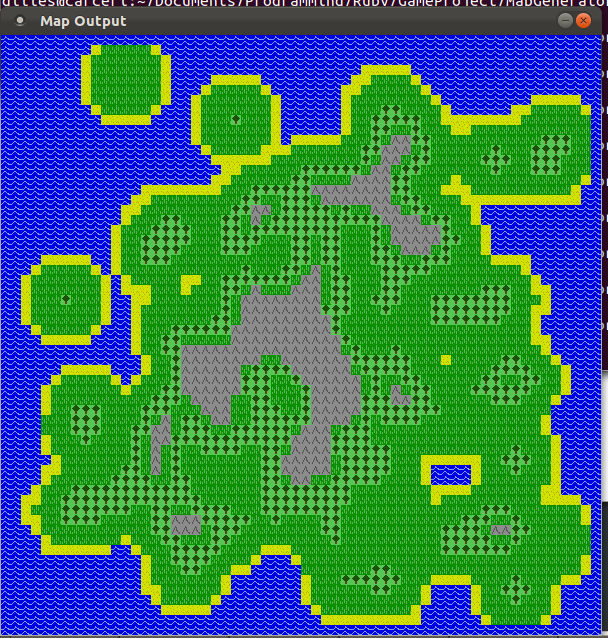 Creating a random 2d game world map, Part 2: Adding rivers and lakes – | ?- BlogName = _. 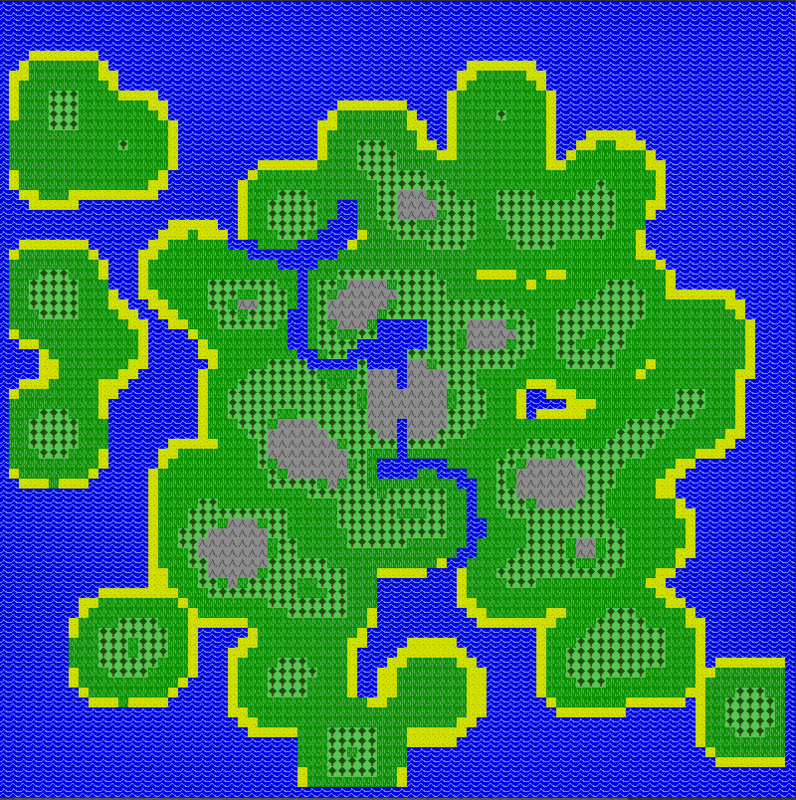 A while back I published a post about how to go about creating random 2d game world maps. I was looking to create something that could be used for a game similar to those old Might and Magic games. Since then, I improved my maps and I also added some rivers and lakes. To create rivers and lakes, I created a river filter. Since my height maps were already accepting filters for my Gaussian Blur filters I used the same underlying mechanic. This returns a new heightmap which has been filtered by the parameter. To create the river filter, I create a new height map which I call a rain map. This is a normal height map, but instead of interpreting the values as the height of the terrain, we simply interpret them as the quantity of water that fell over an area. The rain map is of the same size as my height map, which means I can superimpose the two to find out where rain has fallen on my generated world. In the river filter I use a rain level threshold. Wherever it has rained sufficiently to go over that threshold value, I will use that spot to start a river/lake. If you are using the height maps parameters from my post on generating heightmaps here are the configuration values I am using for a 80×80 rain map. There is no need for the particles to cover the whole map as we are only interested in knowing the places where it has rained a lot. We can thus save time by using configuration values to generate a few heavy spots of rain (lighter spots of rain wouldn’t have crossed the rain level threshold anyway and would have been ignored). Note that I use a single pass of Gaussian filter blurring on my rain maps. To get similar results on larger maps calculate the difference in total pixels of the larger height map and modify the number_of_drop_points, min_particles and max_particles by that factor. In my implementation of the river filter, I decided to only start rivers in mountains where a sufficient rain threshold had been achieved. This way all my rivers are coming down from mountains. The first step is to find the different river starting points. It is best to leave out some spaces between each starting point to make sure we do not cover too much of the map with our rivers. In this last code sample my river threshold is at 80 and I added the additional condition that my height map height should be at 68. For reference, when creating a world, I consider height values of 70 and up as mountains. After some experimentation, I ended using a slightly lower value (68). Not only does it allows for rivers to start next to mountains but the overall result is more pleasing. Now that we have our starting points we can create river paths. We need to store those river paths inside arrays. Once we have all our river paths in memory we can dig the rivers afterwards. If we dig our rivers as we go, it will be difficult not to keep going back into spots we have already dug. The system to create river paths uses a “find lowest neighbor” method to find out where the river should be flowing next. When finding our lowest neighbor we must skip our current location, of course, and the pixels in diagonal. 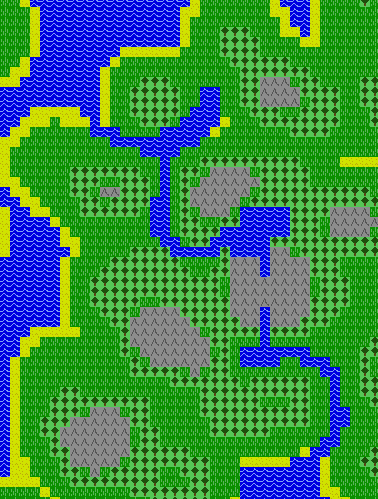 Because diagonal rivers look really unnatural when converted into 2d tiles. 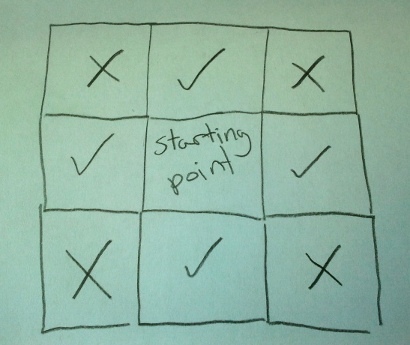 The following picture illustrates with check marks which pixels must looked at to find the lowest neighbor. Of course a more realistic river filter would fill up all adjacent pixels up to a certain level with water. 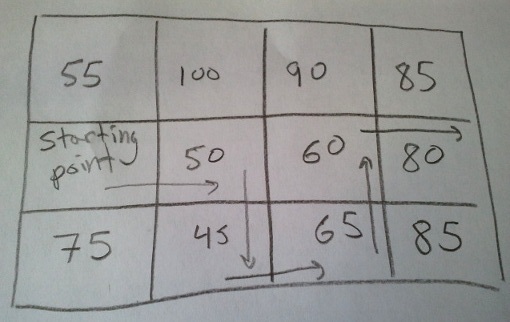 In this last picture, with a more realistic system, the pixel with a value of 55 would get filled before the one with a value of 65. While this would make for a more realistic simulation of rain accumulation, we do not need to go this far unless we actually wish too. You will still get broad rivers and lakes with the former approach when you have groups of even pixels next to each other. You stop your river path when you reach a body of water. Once all your river paths have been generated independently, you can dig rivers by replacing the pixels on the river paths with 0 (or what ever value you use to signify water). Furthermore, the existing rain map could be used for other purposes, like creating biomes. A lower altitude area that didn’t get any precipitations could become a desert, while another which got a lot of precipitations over a large flat expanse could be turned into a swamp. That’s all for now. Keep tuned for other posts on creating a random 2d world in the future. UPDATE: I published a part 3 to this article: Cities, caves and snow. Gilles Leblanc I’m a software consultant working in Montreal, I run my own consulting business NP-complet. My line of work is primarily developing web applications. Pingback: Randomly generating a 2d RPG world – | ?- BlogName = _.